London sports a very small Ethiopian community (of around 30,000) and a handful of Ethiopian restaurants, mostly in North London. I recently visited Addis which has received pretty good blog and critic reviews over the past few years. Ethiopian cuisine centers around injera which is a flatbread made of teff flour (made from an indigenous grass) risen with yeast resulting in a light, spongy texture which is a bit like a crumpet. 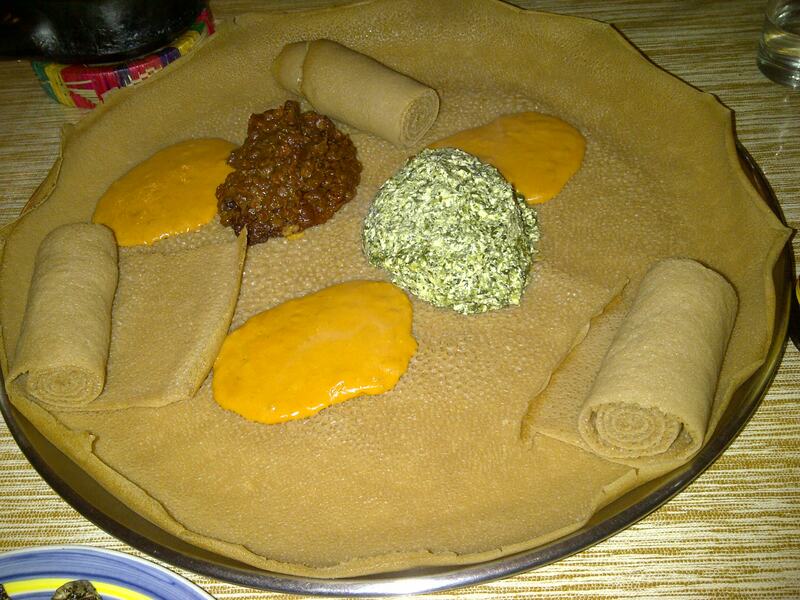 A mix of dishes are spooned onto the injera and can be scooped up in the bread with your hands. 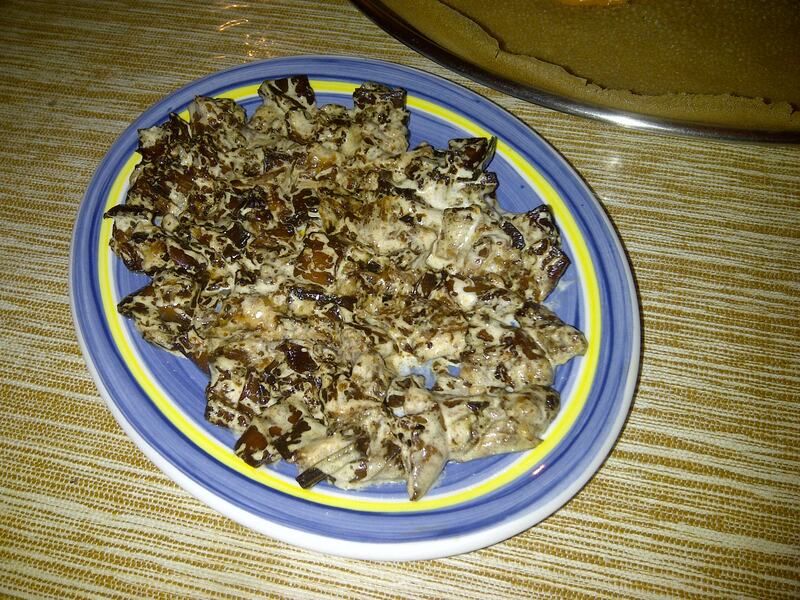 All of the standard dishes at Addis are served on the injera and it is a very fun, but messy, way to eat. I went with a couple of veggie friends and we shared a mix of vegetarian dishes (the menu is very veggie friendly). The orange blobs you can see in the photo above were Shiro Wot (£7.55) which is puréed chickpeas with tomatoes and a hint of cumin – very simple but extremely tasty. Misser Wot (£4) consisted of stewed lentils in a rather spicy sauce and was similar to daal. Ayeb Be Gomen (£5.50) was a dish of cottage cheese and spinach with some mild herbs; it was very tart but nicely refreshing. The most disappointing dish was the Selata Aswad (£3.55) – a fried aubergine salad with tahini, it was served lukewarm and I don’t think the aubergines had been properly salted before cooking because they were very bitter. However, that was the only black mark in a generally good meal. A quick word of warning on the service – it is very slow and relaxed, this is not a place to visit if you are in a rush. I can’t handle caffeine late at night so I didn’t try this, but the “coffee ceremony” sounds interesting – apparently the beans are roasted in the kitchen then brought out to the table for you to have a good sniff, before being taken back to be ground, with the freshly made coffee soon re-appearing in a clay pot. Very big flavours – certainly worth a visit, but it is small and gets very busy, so make a reservation.